Aurora Mahassine’s green-drenched visions for cities and public space might feel familiar to The Fifth Sacred Thing fans. The artist and designer, whose inspiring ecological architecture experiments helped to popularize Living Architecture as a viable option for city planning, creates cityscapes so reminiscent of Starhawk’s San Francisco in 2049 that they might well be backdrops for scenes from the TFST movie – and indeed they will, given Aurora’s contribution as an advisor and visionary artist for the film. Indeed, Aurora’s many projects seem as though lifted straight from this future vision. From her Habitile™ and Habitower™ modular living wall systems, to the 5 years she spent working with Rana Creek Designs on the California Academy of Science’s living roof , integrating organic living systems into the urban landscape is Aurora’s answer to creating the future she sees for humanity. SEE: 3D Rendering of Habitiles in action: 3D EcoSystem Video Flyover by David Vasquez. As part of our Green Plan for film production, it is our aim to transform cities by creating living sets; actual permaculture improvements that can be used for the film and then left to flourish after the shoot is complete. We are eager to use Aurora’s concepts in the creation of these legacy projects for the film; Habitile, for example, can beautify and enliven city views, create new habitat, and serve as living downspouts routing rainwater safely and beautifully through our urban landscape. Later, Aurora met Starhawk through her interest in permaculture, Spiral Dance and Reclaiming – she took the Earth Activist training in 2003. “As a young adult, being steeped in a kind of doomsday, end-of-the-world ecological damage nuclear war et cetera mentality, it became very important to me to not operate in a fighting mode. I didn’t want to be a warrior per se, but be a creative person who offers alternative tools and visions for a positive future.” Their shared affinity for this approach made Aurora a natural fit to help advise on the cityscapes and vision for the future California. Aurora’s latest efforts back home include her work with San Francisco’s Please Touch Community Garden. This urban rehab project partnered artists with the Lighthouse for the Blind to transform a blighted space into a multi-use community garden, designed to be accessible for people of all abilities. She’s also been a speaker at several ecological conferences. Spreading her wings in curatorial realms, she just launched the Reternity Project, an interactive cultural exhibit with AAMLO, the African American Museum and Library of Oakland. They inaugurated the new seed library on January 19th, 2012 along with artworks from Milton510 Bowens’ “In My Global Hood” show. An associated local green resources map with Oaklandish is under way. Lately, Aurora has been on the hunt for collaborators with business and legal acumen to help nurture her patented Habitile into larger-scale viability and success. 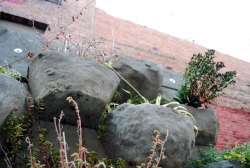 With any luck, we’ll be seeing living walls like hers spring up in cities everywhere – without waiting until 2048.